Nonprofit data nerds have been waiting for this for six months. The Giving USA 2015 Report is here! This year, the longest-running annual report on giving is celebrating six decades of charitable facts and figures. The report was researched and written by the Indiana University Lilly Family School of Philanthropy and published by Giving USA. This year, there's a lot of good news across the nonprofit sector. And here's what you need to know from this year's report. Charitable contributions topped $358.38 billion in 2014, the highest in the report's 60-year history. U.S. giving increased 7.1% over 2013. And 2014 marked the 5th consecutive year of year-over-year giving increases. U.S. charitable giving is broken down in terms of individual gifts, bequests, foundation giving and corporate support. All four categories grew in 2014. Of the four sources, bequests saw the largest increase (up 15.5% over 2013). Individual giving continues to represent the largest piece of the pie. When you add bequests (8%) and gifts from family foundations (7%), individuals are responsible for 87% of the total giving. FUN FACT: Corporate giving is largely in-kind donations, and pharmaceuticals make up a large number of those gifts. Eight out of nine recipient types saw year-over-year increases. 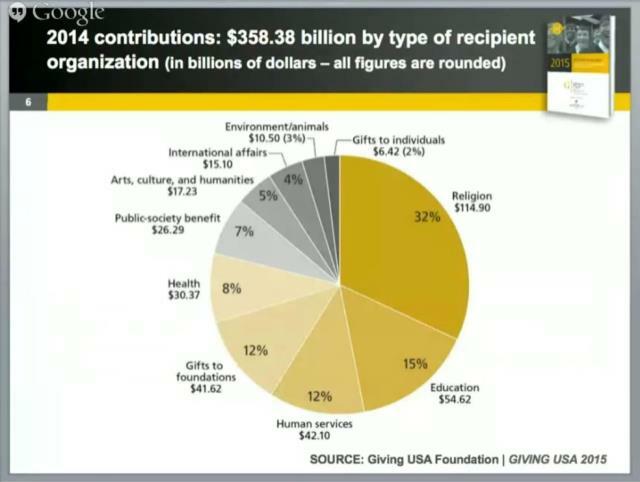 Three sectors (Religion, Education and Human Services) represent more than half of total giving. Religion, which includes houses of worship, continues to receive the highest percentage of gifts. 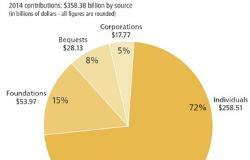 FUN FACT: Thirty years ago, Religion, as a sector, represented two-thirds of total giving. Arts has shown an especially strong recovery since the recession. 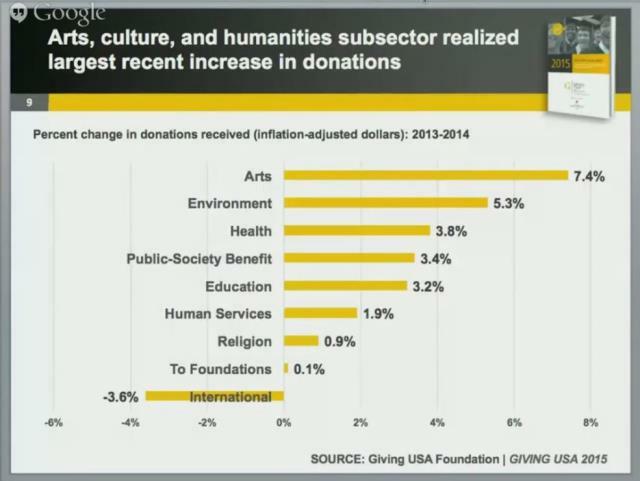 The increase in giving to Arts reflects the general recovery of the economy. Also, since high net worth individuals are often patrons of the arts, the increase in giving also suggests the recovery of these donors' investment portfolios, which is good news for U.S. charity in general. 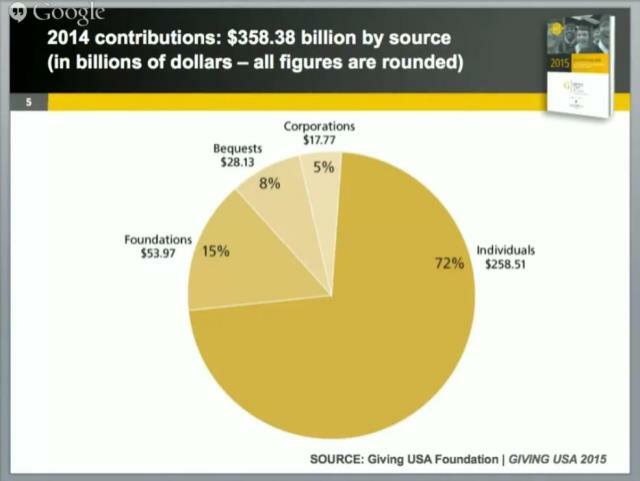 Giving BY foundations is up (8.2%). However, giving TO foundations is flat (0.1%). This is attributed in part to the rise in popularity of donor-advised funds. Many donors find these funds less expensive to set-up and much easier to manage than a traditional foundation. FUN FACT: Fidelity Charitable is currently the #2 U.S. charity, thanks to contributions to its donor-advised funds. It won't be long before Fidelity Charitable overtakes the top spot, currently held by United Way. International was the only subsector that did not see growth from the previous year. This is attributed to fewer global scale disasters as well as an increase in the number of donors who choose to support non-U.S. charities and local, on-the-ground efforts during times of need. Individuals continue to be the single largest source of gifts, and we're beginning to see considerable growth from bequests. Gifts from individuals and estates will continue to increase. That's why it's imperative that your nonprofit has a four-point donor development plan that includes identification, cultivation, solicitation and, most importantly, stewardship. If you don't have a donor development plan, let's talk! I can help you create a plan to help you identify and connect with more donors, which will help you raise more money for your nonprofit.